Martha passed away on the 26th of December last year. When she was still healthy, we shared many a pot of cheese fondue with her during the cold winter months. Her fondue was without question, the best I've ever had anywhere. So in her memory, we made a proper cheese fondue. I've already posted Martha's fondue recipe 5 years ago (she was still making them then), but since it was one of the very early posts here on Just Hungry, it has no relevant picture to accompany the recipe or anything. To rectify that, here again is Martha's proper Swiss fondue, with many photos and detailed instructions. Cheese fondue is a traditional Swiss dish that originated in the Alps, mainly in and around the canton of Valais (French) / Wallis (German). Contrary to popular view outside of Switzerland, it did not originate as an après-ski snack; it's a hearty peasant dish, using ingredients that were available in the winter: cheese, wine, coarse peasant bread. And since it a traditional dish, it never went 'out of fashion' or 'died out', as you might think it did if you live in the UK or the US or any place that had the Great Fondue Craze of the '70s, when a fondue set was a ubiquitous wedding present. Finally, fondue is always served as the main dish, not an appetizer or as part of a multicourse meal. So, what do you need for la fondue? First you need an appropriately shaped pot. The traditional shape is a fairly shallow, rounded ceramic pot with handle, like this one. The critical part is the rounded part, as we'll see later. This is one of the two pots we have. You also need something to keep the cheese warm. You actually cook the sauce on the stovetop, so you don't need a tabletop burner, though you can use one on a low flame. The ideal is a spirit burner, like this one. The pot is suspended over it on the iron frame. The cheese sauce is usually made up of 2 or more types of cheese. A good moderately aged Gruyère (aged at least 8 to 12 months) is usually one of them, since it has such great flavor. Another popular cheese is Emmenthaler, the stereotypical 'Swiss cheese' with the big holes. Emmenthaler does make the sauce very stringy and somewhat gooey, which can make it a bit hard to handle. Martha's preference was to use Vacherin Fribourgeois, which has a full, distinctive flavor and does not make the sauce stringy. Her secret ingredient was one block of the 'spreadable cheese' that comes wrapped in foil triangles in a round cardboard box (e.g. Laughing Cow). The otherwise icky cheese helps all the cheeses melt together and stay together coherently. 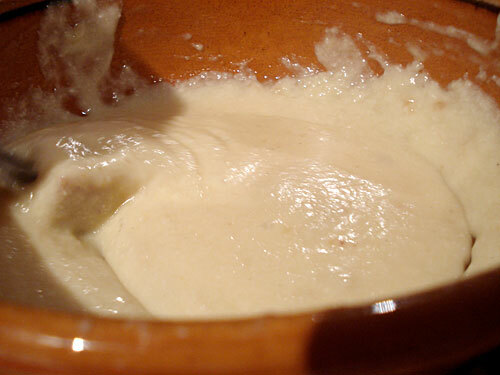 The other important components in a fondue sauce are white wine and kirsch. Here in Switzerland, a young Chasselas Romand, aka Fendant, with a slight sourness is used. If you can't get hold of such a wine, a Sauvignon Blanc will do, perhaps with a squeeze of lemon juice. And kirsch just adds that extra kick. In Switzerland, only bread is dipped into the cheese. Any kind of bread with a sturdy crust and a fairly robust crumb is good: a decent baguette, any kind of 'artisan' bread. Here we used a Weizenbrot, a hearty country bread. Notice all the pieces are cut so they each have a side with crust. I guess you could dip other things, but you will still want to have a good quantity of bread. I know people like to dip things like raw or boiled vegetables, apple or pear slices and the like (in Japan they like to dip things like boiled quail eggs, wiener sausages and chikuwa (fish sausage-like things)...), but I think that if you need vegetable crudités or fruit, they are best served alongside the fondue, and to just dip bread in the sauce. 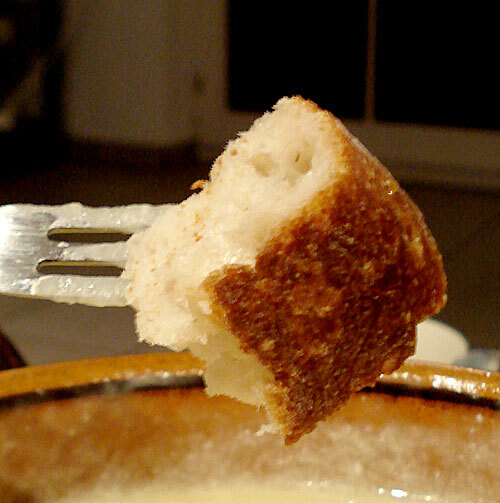 (And if you get invited to a Swiss home for fondue, you'll only get bread in most cases.) If you are gluten-intolerant, use a gluten-free bread. This amount of sauce will serve 4 people as the main course. If you only intend to have fondue as part of a bigger meal, adjust the amounts accordingly. Take your speared-bread fork and stir it around in the cheese sauce. Each person should scrape the sides and the bottom of the pot at least once with each go. This prevents the cheese sauce from sticking or burning on the sides. None of that namby-pamby dip-and-go! 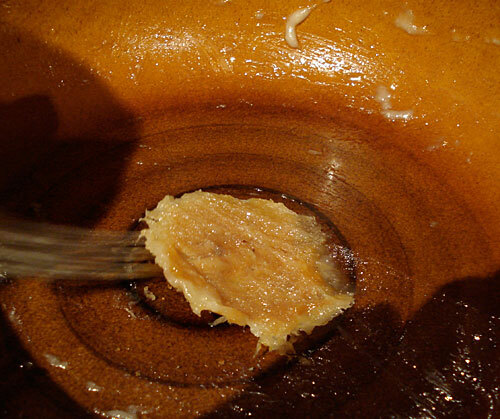 Here the bread being used to scrape off the cheese bits that stick to the surface of the pot. Now you see why a rounded-sides pot is ideal; a pot with sharp angles is much harder to scrape around properly. If you do insist on dipping other things into the sauce, you will just want to dip those lightly, but still use the bread for that stir-wipe action. As the cheese sauce gets less and less, it will get thicker. It's important to keep stirring-wiping. You may gradually want to lower the flame's intensity if you can too. 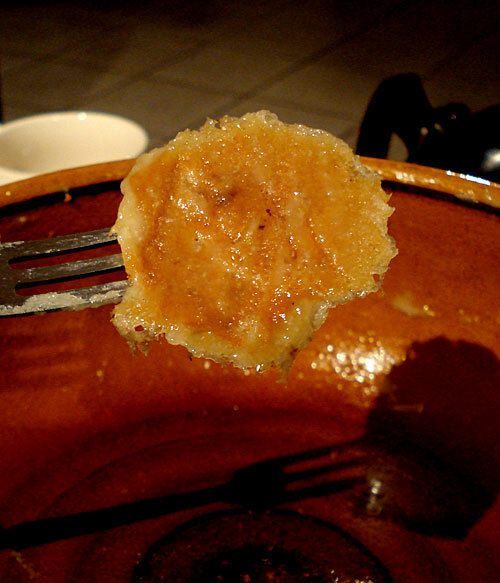 The burned bit is considered to be the final treat of a fondue. A generous cook may cut it up and share it, but a more selfish one (cough) will just pop the whole thing in her mouth. So, there you have it. A proper Swiss cheese fondue, eaten the Swiss way. The same wine that you put into the fondue would be perfect. You could also have kirsch in shot glasses. Martha always served strong black tea, which served as a perfect palate cleanser to counteract the strong taste of the cheese sauce. The winter fruit salad she also served as dessert (usually just whatever citrus fruits were available, like grapefruit, blood or regular orange, etc.) was a nice refreshing ending to the meal. Do remember that this sauce is properly cooked on the stovetop, not just heated through until the cheese melts, so most of the alcohol content will evaporate. Swiss kids eat fondue along with the adults and grow up to be fine upstanding citizens. If you can't have alcohol for religious reasons and so on, this recipe may not be for you. Submitted by maki on 2013-11-07 22:14.
this is almost the same as my grandmothers method. i approve :) she did add some black pepper. normally i lurk here for the japanese recipes, but it was a nice surprise to see such a very swiss recipe. Thank you, Martha and Maki. For those of us non-Swiss who grew up reading "Heidi" and drooling over the Swiss cheese and thick bread that was breakfast and other meals for her, fondue is the perfect adult substitute. Your comments about the "proper" cheeses to use are helpful, and most of what you say to use and do is how friends and I used to make it. The scraping and swirling is a bit different, and we never dipped anything but good old San Francisco sourdough bread into the fondue. Garlic clove, kirsch, nice crisp white wine -- so far so good. Adding the "Laughing Cow" cheese to pull it together is a great secret that you are passing along. Did we give a dash of nutmeg? I don't remember but will tear my recipe boxes and stashes of handwritten recipes apart tomorrow. 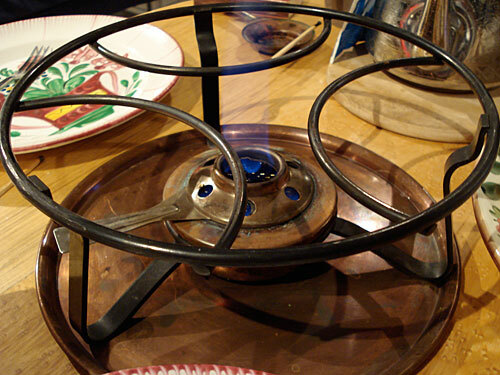 Our fondue pots (from "back in the day") are steep-sided but have stands and adjustable burners. Now, where did I stash those forks? You have singlehandedly started us all in another fondue craze! Perfect timing!! I was looking for a fondue recipe to serve on NY Eve! This is the best I've found! Such helpful details! Thank you Maki! Happy New Year to you! Actually, my mother did add "Laughing Cow-style" cheese into the fondue too. The explanation is quite simply when one looks at the ingredients list of that kind of cheese. It says "Schmelzsalze" (melting salts), and the E numbers lead to sodium phosphate and polyphosphates (both substances considered absolutely harmless, and well established in food preparation). These substances act as emulgators, and therefore help keeping the cheese sauce as sauce and prevent separation. Altough by insufficient stirring and overheating, you still can make it separate. I agree with Max’s explanation why Martha’s secret ingredient works so well. Spreadable cheese products get their unique texture and flavor from “emulsifying salts” (for example, Laughing Cow Original Creamy Swiss Wedges derive their creaminess from a combination of sodium phosphate, sodium polyphosphate, and sodium citrate). Playing with the Modernist Cuisine recipe, I found it’s easy to turn any “natural” cheese into a spreadable cheese or cheese sauce. Melt cheese with the liquid of your choice (e.g., water, beer, milk, broth, or wine) and a little sodium citrate. The more liquid you add, the softer the resulting product. The less sodium citrate, the more whisking required to get a smooth result (with little or no sodium citrate the texture remains icky). The more sodium citrate, the quicker & easier you get a smooth mixture (but, also, the more it tastes like Velveeta than natural cheese). I have no doubt that one could substitute sodium citrate for spreadable cheese in Martha’s recipe, although the flavor will be somewhat different than the phosphate/polyphosphate/citrate formula used by Laughing Cow. Which tastes better would be a personal choice. Yours looks pretty! Can I use one of those burners that are meant for shabu shabu too? Is it the same thing? this is the BEST recipe i have ever gotten!! I'm not Japanese (I'm a Swiss from the French part)! But I think it'll do perfectly. Any table heating source will do, as the basic principle is to keep the cheese warm! When I was a student I spent some time in England and, with a friend, we made a Swiss fondue for a Chinese fellow student: we used a regular saucepan over a regular electric stove, and we all stand around to eat it! ;) This is a bit extreme, but it also worked! Taste of the fondue is the most important, after all! 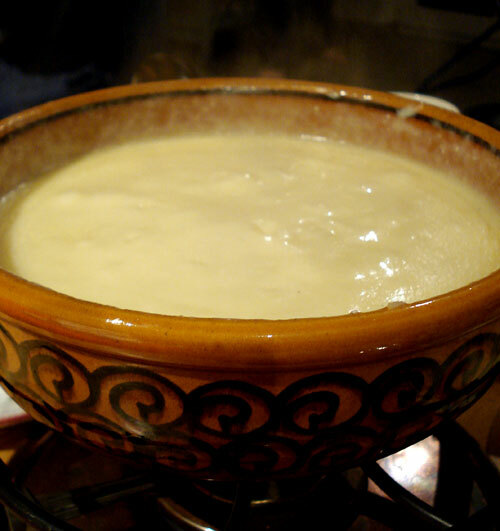 However, it is important to use a thick saucepan or pot : traditional fondue pots are usually made of heavy enamel iron-cast or thick ceramic. This helps cheese to stay warm. And as Maki states, rounded-bottom pots are best, too. Tradition calls for a spirit tabletop burner. However, in recent years, due to accidents with spirit burners, people were encouraged to use fire gel (a gelly paste used for burning). This doesn't work so well (heat is lower with gel fuel), but is OK (besides, it's getting more and more difficult to get spirit burners in shops). In Switzerland, these days, I see more and more electrical table burners being advertised in shops, too. I've never had cheese fondue but looking at your pictures was enough to make my mouth water! I'll have to try it some day! Fondue is adrift in the cosmic concsiousness and has come doubly my way. Now to pull out a suitable pot and start melting. Hah hah hah! Thanks so much for posting this recipe. It became a new year's eve dinner for me and my husband. Previously, we only had eaten the boxed fondues from the store, and this recipe is so much better. Not too stinky and way more flavorful. Is there any substitution for kirsch? It was really difficult to find in my area. Possible substitutes should be as closely related to Kirsch as possible. In any case, it should be a clear, non-sweet, fruit distillate, such as Mirabell, Plum, Prune or similar. If that is not available, Apple or Pears could work. Hmmm... Williamine might actually be suitable (but is it easier to get your hands on than on Kirsch?). Grape-based distillates might also work, such as Grappa or a more generic Eau-de-vie. You might try if an oak-barrel-aged product (Cognac) would not change the flavor of the Fondue too much. You can easily skip the kirsch. It won't ruin your fondue. Many Swiss do without it (or drink it along with their fondue). I'm a Swiss and my Mom has never put any kirsch or substitute of it in her fondue! I sometimes add kirsch, sometimes not. Thanks for posting it. I haven't tried this before and just looking at the pictures makes me excited to try it at home. Oh, this was almighty wicked good. I didn't think it would come together properly, but a whisk smoothed things out. Thanks for posting it! This is exactly as I know it to make cheese fondue. However, the Laughing Cow hint (new to us) is one I will add on Saturday night when friends are coming to our house for their first cheese fondue. They are asking about what this will be like, because we have promised to make it just like we learned when we lived a couple of times in Switzerland (Berne). This site will give them a Preview of Coming Attractions...Very nice! I wish I knew a good substitute for Vacherin, as I am not able to add it to my Gruyer and Appenzellar cheeses this time...not available everywhere I have always found it. I've always added it. I tried this recipe and it was wonderful. It had been so long since I had a good fondue and this one scored all the high marks. I didn't have Laughing Cow but instead threw in a bit of Brie... The fondue was still delicious and creamy, although I won't claim it was the Brie, but it certainly didn't hurt! Uhm... it is look like very delicious..
Wow, if I could, I would. Sorry but you got the bagna caoda thing all wrong. It is a hot sauce made with anchovies, garlick, bread cooked very slowly in olive oil till it becomes a paste. You dip vegetables in it, not bread. Take it from a real piemotese. A week or so ago we made a cheese fondue and we made it from lots of grated old cheese, garden herb stock and a bit of Danish Blue, it was the first 'selfmade' cheese fondue I ever ate (always the prepackaged ones) and it is so delicious! Next time, I'll try Martha's recipe for sure!! Definetely I will score high with this recipe.... if I find the pot. Thanks for all posts that certainly fired this historical moment...Proper Swiss Cheese Fondue in Miami at 5C degrees... the most we can get. Have you all an excllent 2010 !!! If you can't find Vacherin Fribourgeois, Raclette (French or Swiss) is a pretty good substitute. Alex and Gaga, you don't need a fondue pot, I've used a double boiler many times, for both cheese and chocolate. I've even used a silver metal mixing bowl inside a regular saucepan with 2 inches of water. 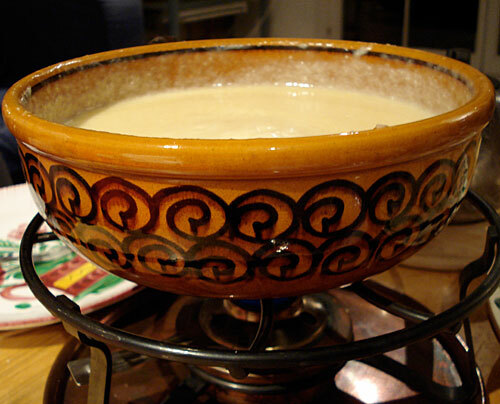 This is one of the few proper swiss fondue recipes that I came across in the english speaking internet. I'm swiss myself and fondue is one of my favourite dishes during the cold season (which is quite long in switzerland :-)). In Switzerland we have a couple of different types of cheese fondues, but the moité-moité version is the most popular and also the best in my opinion. Good quality (at least medium aged) Gruyere and Vacherin Fribourgeois are both essential for a tasty fondue. The fondue will only be as good as the cheese you put into it. The only thing missing here is the seasoning: some fresh ground nutmeg and black pepper. Also we normally add a bit of fresh lemon juice which helps the cheese and wine go together. Either way you stir, you will always end up with a delicious fondue. Have fun! Thanks for this post. :-) It's so beautiful and looks very delicious, too! Your pics remind me of my friend here in the Philippines (married to a Swiss gentleman from Berne) who owns a Swiss resto called "Vieux Chalet" in the eastern part of Metro Manila (our National Capital Region). She was the one who introduced me to fondue and the Swiss cuisine. I really loved it. I never bought a fondue set because I wasn't sure if it was difficult to clean or not, and how exactly one should be handling it. I only had fondue once, and the family that treated us to it also put a bowl of beluga caviar on the table (they used the ones on www.1caviar.com)and after dipping the bread into cheese, we dipped them into the caviar, and they stuck to the cheese nicely. It was very delicious. Easy cleaning of a fondue pot is by soaking it in cold water. Cold water is the key! This way, remaining bits of cheese will come off easily. thank you for posting this fabulous, fool-proof recipe! i re-started a longstanding tradition of serving swiss fondue this new year's eve after having trouble with the fondue "breaking" on my two latest attempts. on reading this technique, which is not at all fussy or difficult, i decided to try once more. not only is it as authentic-tasting as any i've ever had, it required none of the "drop cheese in by tablespoons" drudgery most recipes call for. i simply combined the ingredients as outlined, and added a bit more wine (plus a squeeze of lemon as recommended) to taste. it came out perfectly. such a treat, and now our fondue tradition is rekindled! my best to you! I am from Washington D.C. but have been in Geneve for 10 years.I have a dear friend who is from Zurich. She has the same recipe except she adds nutmeg and black pepper. I have had many compliments when I have made this fondue. We once made it outside in my daughter's primary school as a neighborhood get together. All in all we had 7 pots going and many different variations but my girlfriend's recipe was the hands-down favorite! The secret to outside fondue is to cover the pot with tin foil after putting in garlic and wine and let it really heat up before adding the rest. This way it does not take forever to get the cheese to melt. MMMmmm now wishing for frosty cold weather! I'm a proper Swiss and I don't like Cheese Fondue. But I approve of your recipe, it looks and sounds like the real deal (and not everything considered "real" Swiss is in fact real). I much prefer Raclette, maybe you can take "A Proper Swiss Raclette" into your collection? It's delicious. I was looking for a real and "true" fromage fondue recipe, given that I haven't made it in approximately twenty five years and I FOUND IT! It is your Martha's recipe. How true it is that people find something simple and delicious, like this fondue recipe and immediately try to change it by introducing changes, which are conducive to results that change everything and, frankly, ruin a good thing. I grew up eating fondue and have never changed it. One time, while in downtown Fresno, California, I happened into a restaurant called Fondue House. It turned out to be nothing but a place where the only fondue there was the name, while what they offered was a rare mixture of flagrant changes, which tasted like anything but fondue. Thank you so much for keeping your recipe (or rather Martha's) on the website, so older people like me could refresh the memory and enjoy it again, prepared as it should be. Great recipe, I will make it on Christmas Eve. I need to check and see if my mom's fondue pot is in the attic still or if I returned it to her. In any event, my grandmother used to add a bit of New York cheddar to her Emmenthaler and Appenzeller. Apparently my grandfather ( Swiss born but emigrated to the US when he was 13 and started working as a cheese maker in up state NY) apparently he approved. When my mom and dad used to serve it at parties, if the bread fell off of your fork while dipping, you had to take a shot of Kirsch.I think my grandfather might scoff at the processed cheese being added. Although he might like it with Limburger. Ha ha. This was a super read........as a child my mother loved to serve us cheese fondue and also fondue for meat. Today I told my mother to visit me and I had big plans to make the fondue as I knew it. Sadly and tormented I have to settle what is available in my neighbor as it was a spontaneous event. No Kirsch.....boy was I disappointed I will use cognac. No Emmethaler..... so I use Assiago (because it is a good melter) and triple creme cheese. I used to have a pot just like that. Someone borrowed and broke it. I would love to replace it. I once had a pot purchased in Germany exactly like this one. Some borrowed and broke it. I would love to replace it, any sources? As expats living in Switzerland, we were treated to a generations-old Swiss fondue two weeks ago by some friends. I was excited to replicate the secret recipe, and found this one to be excellent. Although I forgot the Laughing Cow, mine turned out exceptionally smooth and well integrated (I did heat the wine just to the point where little bubbles formed). 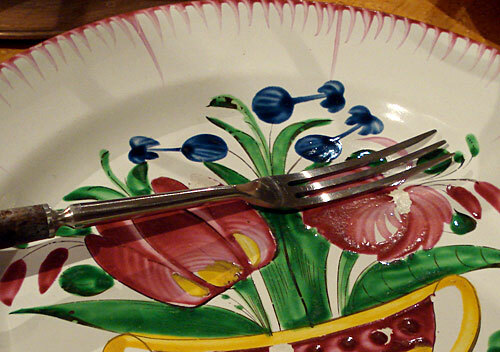 Using a fork was the most effective tool for blending the melting cheese. At the same time, I felt the cheese needed a bit more kick. Next time I will add the lemon juice and black pepper. Rather than buying a high-quality bag of moite-moite, I will grate and mix my own too. Definitely a great treat. We were lucky enough to be taking a friend to Gruyeres and so the bread we used was a local crusty brown variety. Very good indeed. Thanks! I had real fondue in Geneva years ago. I would love an excuse to subsist on this. Thank you so much! We were in Bruni, Switzerland just last month and were served fondue in our hosts home. Fabulous! We went with her to buy the cheese and bread, then worked in the kitchen while she prepared it. She used 3 cheeses: Appenzeller, Gruyere, and Vacherin Fribourgeois. It was fabulous! Thank you for going in to so much detail. Now I feel I'll be able to replicate that wonderful experience for my husband's birthday this month. He'll be SO surprised! I didn't realize that the Fondue was actually meant to be the whole meal, even though that's how it was served to us. So funny, right? But now that I know I'm sticking with it! Thank you for this recipe. I've only tried cheese fondue once, in a fake "alpine" restaurant on a Japanese mountainside staffed by college students dressed like Heidi, and it was so very nasty that it put me off fondue for life. By the way, I was wondering if and when you are planning to comment on the 食材偽装表(food mislabeling) scandal currently unfolding here in Japan. It's a big huge deal for the foodies. Heck, even the non-foodies are pissed. Your thoughts? My father (It's a fairly well established tradition in many Swiss families that the father cooks the fondue) usually also adds some nutmeg and pepper for flavouring. He also adds about 3-4 cut up garlic cloves to the fondue. Instead of bread, which we always serve with fondue, you can also dip pears and pre-cooked potatoes, if bread is not suitable. Sometimes my parents substitute the white wine and kirsh with apple cider if somebody doesn't drink alcohol. The taste is almost the same. If you have too much fondue cheese (we sometimes buy too much on purpose), you can put slices of the cheese on bread slices and bake it in the oven. It's called "Käseschnitte" in German, and it's also served as dinner. You can also freeze the cheese before doing that. It's a pretty quick and easy dinner. (almost) Everything taste better with cheese fondue. Thanks for sharing the cheese blends! Gosh sooo yummy, always loved melted cheese and bread, only problem, do not own a fondue set, will have to figure out what to heat cheese with. When you talk about the fondue hype in the 70's, feel free to add Italy to the list: my parents got married in 1965 and they also got a fondue bourguignonne set. I never made cheese fondue before, this evening I'll be fallowing your recupe step by step, the only difference being that I won't use vacherin fribourgeois since I can't find them. I have gruyere, maybe I'll add an Emmenthaler (the real one) but I already know how it melts. Thanks for you recipe, I came here after S@sch from alt.binariers.food recommended this page. Thank you for this great recipe. My family has been having fondue for Christmas Eve dinner for 50 years. It all started when my father went on a business trip to Europe in the early 1960s and brought back a fondue pot. Many years ago I saw a television show in the U.S. explaining as you did that fondue was a peasants' dish as all the farmers up in the high valleys had to eat to tide them over the winter was the cheese and bread they had made. As an adult I have spent a lot of time in Switzerland-one of the most beautiful places on earth! When I spent some time in Switzerland (this is more than 20 years ago) we served fondue in the piste top cafe I worked in. 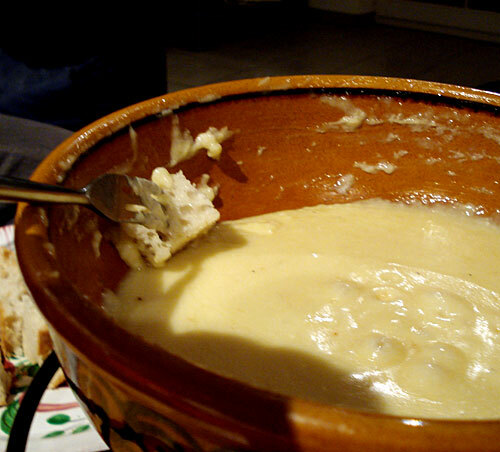 From memory, an egg and kirsch was often added to the pot and mixed in with the final bit of cheese. Does my memory serve me right? Thanks, Maki, for this wonderful fondue recipe! My parents are Swiss (but I grew up in the US and England.). My mother used the same recipe as Martha with the addition of black pepper and nutmeg and without the Laughing Cow. I feel a real kinship with you as we share some of the same cultural influences -- Swiss and Japanese. I spent 12 wonderful years in Nagoya. It seemed completely normal to find a fondue recipe on a Japanese blog! Thanks again. I have an exchange student from Switzerland and are throwing her a party to celebrate her 18th birthday. How would I add more fondue to the pot as we run low? We have about 30 people coming. This is my Grandmothers exact recipe. She died in 2008 at the age of 94. She came from La Chaud Fond in Switzerland. We did not have a stand and fondue dish but stood around the coal stove with dinner forks dipping in the pot. That last bit of crusted cheese was for me her favourite grandson. She had a firm rule that we children could not drink any liquid including water for at least one hour after eating La Fondue as we would get drunk in her own old wives tale I guess. I remember it all fondly and at least once a year I make it. Thank you for the recipe. We are planning to close 2014 with a great fondue with some good friends and this recipe has made me impatient. As to what to drink with fondue, this may seem sacrilegious to fondue purists, but i don't drink anything but red wine, and i find that it goes just perfectly with the cheese. At last a real fondue recipe! I was born in Switzerland and have lived in the U.S. for nearly 40 years. The recipe is the real deal, except we never used the processed cheese, but I'm going to try to add it anyway. I especially appreciate the real proportions, my mother used to say, use 200 gr. of cheese for each man, and 150 gr. for each woman at the table. In my family we eat fondue twice a year, on Christmas Day and during our annual family reunion in late summer. I don't quite use half/half gruyère/emmenthal, more like 2/3 and 1/3 because I come from the French-speaking part of Switzerland. Always use freshly ground pepper as a finishing touch. 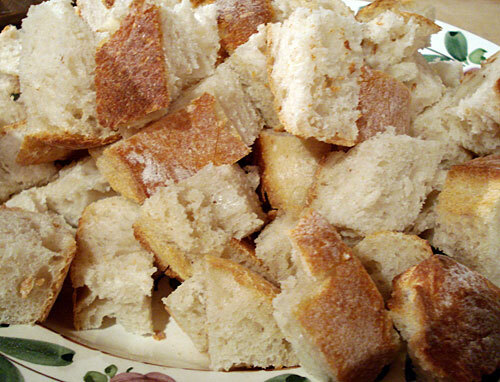 Gluten-sensitive people can use boiled red-skin potatoes, it's delicious, and I always have to have some on hand because everyone loves the combination, but a crusty baguette is best otherwise, never sourdough bread! Tradition says that if you are a man and drop your bread in the fondue, you have to pay for the next bottle of wine; if you're a woman, you have to kiss the man on your left. I always serve raclette-specific condiments with my fondue: cornichons and pickled cocktail onions--they temper down the greasiness of all that cheese. -You will start a war in Switzerland if you say that traditional fondue originated "mainly in and around the canton of Valais". It's origin is controversial. Some says it originated in the Chablais region (which is between Valais, Vaud and France's Haute-Savoie), others swears it come from La Gruyère, in Fribourg (it's where the Gruyère cheese come from). 2) the "creamy" part can change: In Fribourg, it will always be Vacherin fribourgeois. In Valais, it's often a fromage d'alpage (Alp cheese) or Raclette. In the German part of Switzerland, it's often Emmenthal (but in the french part, we will never use it. As written here, we think that it does make the sauce stringy and gooey ^ ^). 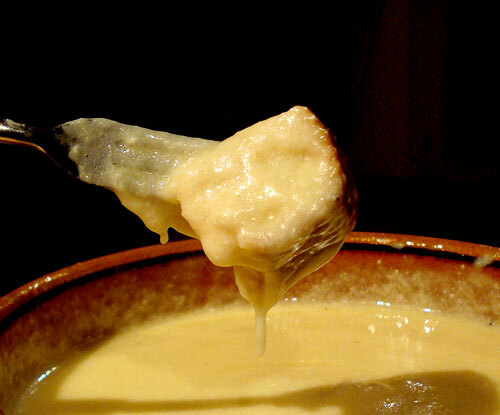 Overall in Switzerland, the most common fondue is the "moitié-moité" (half-half) with 50% Gruyère and 50% Vacherin. -A lot of people don't discard the garlic after having rub the inside of the fondue pot with it. They cut the used clove in small pieces and add it to the pot. Doing that way, you can randomly get a small piece of garlic while eating the fondue, which is a nice surprise for garlic lovers. Usually the cooker ask their guests if they like garlic before doing it. -For the black pepper question: most people add pepper in the fondue, but not everybody. With guests or in a restaurant, the usual way is to provide a pepper mill next to the pot. Just before the first people dips his bread, he/she usually ask others if they want pepper to be added inside the pot or not. If they agreed, pepper is added generously and the first people to dip mix it all with his first piece of bread. If not, people add pepper in their own plate and gently roll their bread covered in cheese in it. -In the french part of Switzerland, nutmeg is sometimes used, but it's not very common. -As stated before,spreadable cheese are kirsch are optional. IMHO, the best way is to drink kirsch separately. This way, before dipping it into the pot, you can slightly dip your bread into your glass from time to time (as written here). A nice change!